Wolf will be honored at this year's San Francisco Pride parade. Soni S.H.S. Wolf, a founding member of Dykes on Bikes, has died at age 69. Wolf died of natural causes last Wednesday, according to the San Francisco–based organization’s website. She had served as the group’s secretary and historian for many years, and stepped down from administrative duties last July. 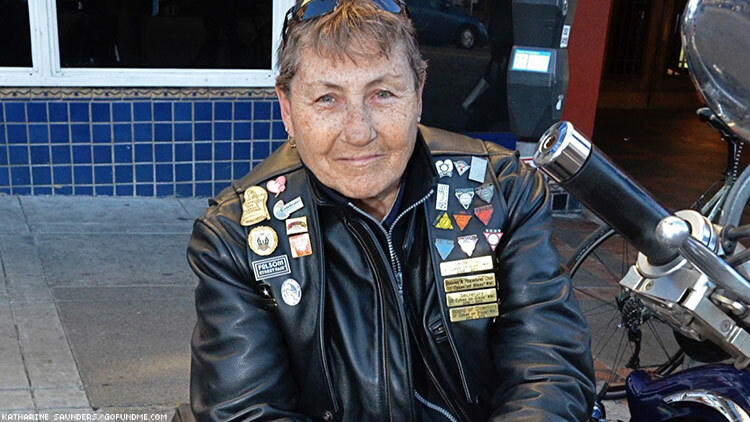 She was part of a contingent of women on motorcycles who first led the San Francisco Pride Parade in 1976. One of the women informally dubbed the group “Dykes in Bikes,” and the name stuck after the San Francisco Chronicle picked it up, the website notes. Wolf led the efforts to trademark the Dykes on Bikes name and logo. After the U.S. Patent and Trademark Office declined to register the name because officials there considered “dyke” a derogatory term, she worked with a team of lawyers to win the right to use the title. Later, Dykes on Bikes filed a friend of the court brief in another group’s Supreme Court case that eventually resulted in a decision striking down the office’s power to reject names it deemed derogatory. Wolf also “helped the organization evolve into a 501(c)3 nonprofit, spearheading the group’s mission to create a national and international community of women’s motorcyclists supporting philanthropic endeavors in LGBTQ communities,” according to the site. San Francisco Dykes on Bikes is the “mother” group to chapters around the world; there are currently 16. In April, San Francisco Pride officials had named Wolf a community grand marshal of this year’s parade, which will be held June 24. To honor her, friends in the parade will carry the gas tank from the motorcycle she rode in the first Dykes on Bikes contingent. There will also be a public recognition of her contributions from the Pride mainstage that day, and a private memorial service will be held on another date. “Soni was chosen to be one of our Community Grand Marshals in this year’s parade, and we look forward to celebrating her life by continuing the tradition she was so instrumental in establishing over 40 years ago,” said Pride executive director George F. Ridgely Jr. in a prepared statement. “Soni was an integral member of the San Francisco Pride family, and she will be missed.” As usual, Dykes on Bikes will be at the head of the parade. A memorial fund has been established to support the preservation of documents important to the history of Dykes on Bikes, and donations are being taken at a GoFundMe page. Additionally, Dykes on Bikes has created an email address where those who knew Wolf can share their memories: RememberingSoni@dykesonbikes.org.